…for editors, hirers-of-editors, and everyone in between. The Editorial Freelancers Association is a wonderful source of information for freelance editors and for those looking to hire freelance editors. Of special note is their chart of average pay rates for different types of editing, which is based on regular surveys of EFA members. The Copyeditors’ Knowledge Base at KOK Edit is full to the brim of useful information for editors. Want to learn more about the publishing industry? John B. Thompson’s Merchants of Culture is a fascinating study of trade publishing in the US and the UK. 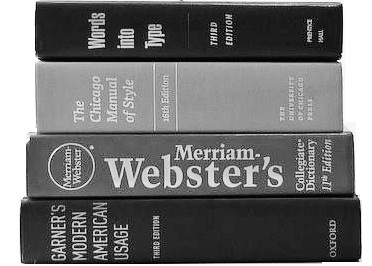 Here’s a handy list of significant rule changes in the 16th edition of the Chicago Manual of Style. Northern California gets a capital N now, and US does not require any periods. The serial comma: Linda Holmes discusses recent rumors of Oxford ditching the serial comma (don’t worry, it’s safe), explains how the serial comma can be very useful in clear writing, and reveals her own soft spot for it (“[I] feel about it the way other people feel about newspapers, green spaces, or virtue”). “The Most Comma Mistakes” by Ben Yagoda (NYT): All you ever wanted to know about commas. KOK Edit’s Marketing Tips for Freelancers knocked my socks off . . . and inspired me to put more energy into my own marketing efforts. Klok is my best friend when I need to track my work time accurately. Font Squirrel: Free (legal) font utopia! Tons of practical self-publishing advice at TheBookDesigner.com. Mr. Kawasaki wrote a great book on self-publishing. Bryan Garner has some excellent tips for letter writers: A Well-Crafted Letter Still Gets the Job Done.